I think this is a repeat, but I liked it so much I thought I would share it again. It had to be shortly after I joined Silver Laughter and shows us packing the van after one of our first jobs. From the sign on the building across the street, it’s a good guess that this was taken in Austin, MN. I believe this was Kim’s van which we used to follow from town to town in Jon’s Pinto and my Chevy Vega. Here we are with all the equipment on the ground in the middle of winter waiting for instructions on where to put what. Sound and light man, Carl Frisch is taking the picture. 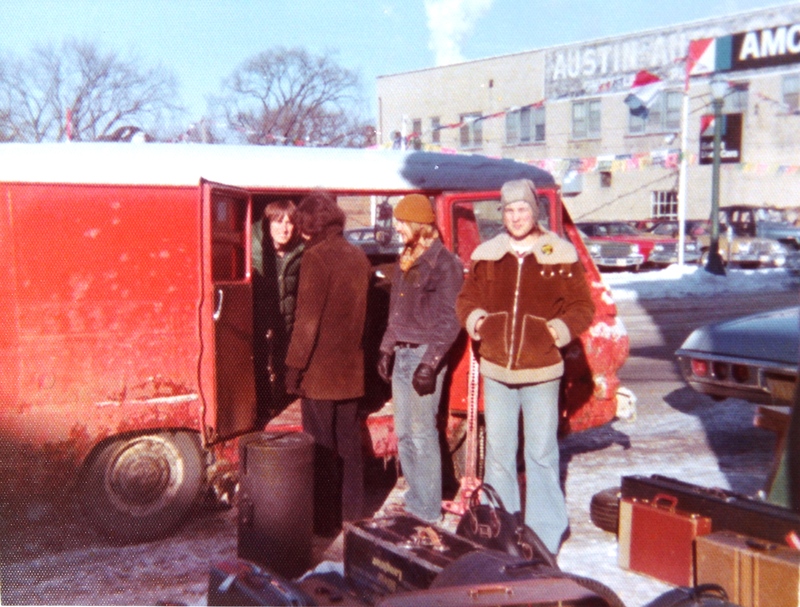 That’s Mick in the van with (from left to right) Mark Zaputil, Kim Ludtke and Jon Ludtke. Glad you posted this Mr. Mick. First time I have seen this photo, I remember playing Austin, MN. It was one of the coldest climate gigs we had. I think this would be in January or February of 75.